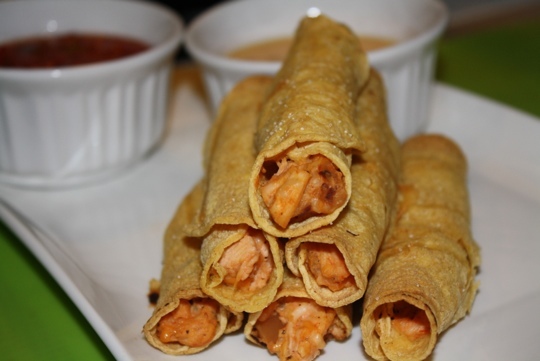 One dish I fondly remember from my childhood is chicken flautas. My mom used to make them for us all the time when I was growing up. Now that I am trying to watch what I eat, this baked version allows me to eat a couple and still be somewhat healthy. I served these little Taquitos with Spanish rice and some Velveeta cheese dip so it reminded me of a dish I used to have in Washington, DC. The creaminess of the filling is different than what I’m used to be it was extremely delicious. Heat oven to 425. Spray a baking sheet with cooking spray. Heat cream cheese in the microwave for 30 seconds so it’s easy to combine with other ingredients. Combine salsa, lime juice, cumin, chili powder, onion powder, granulated garlic and cilantro to cream cheese. Add chicken and cheese and combine well. Heat corn tortillas over an open flame just to make them more pliable. Working with one tortilla at a time, place a large dollop of the chicken mixture towards the edge of a tortilla, keeping it about 1/2 inch from the edges. Roll it up as tight as you can. Place seam side down on the baking sheet. Lay the taquitos on the baking sheet and make sure they are not touching each other. Spray the taquitos with cooking spray and sprinkle kosher salt on top.